Hoophouse tomatoes at full height. 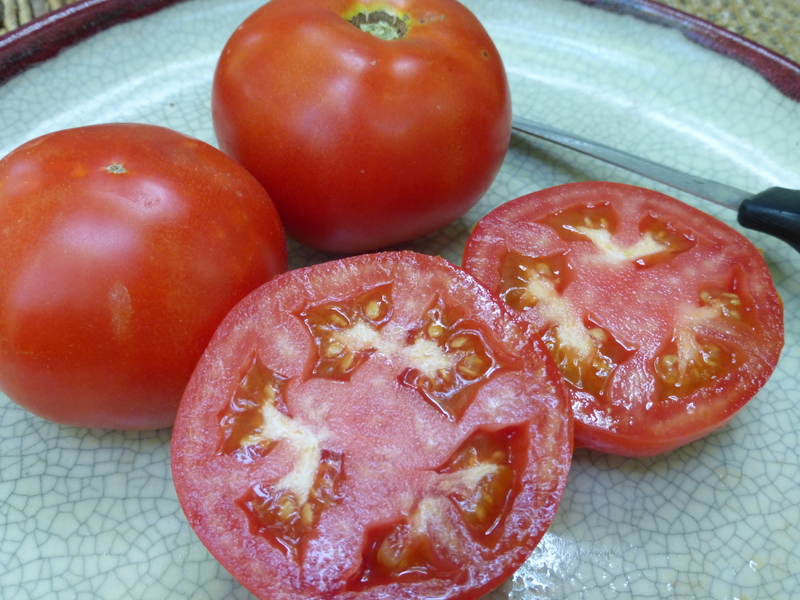 One of the crops we grow in our hoophouse in spring is a range of open-pollinated and heirloom tomatoes. Because it doesn’t rain in there and we use drip irrigation, our plants don’t get water put on the leaves. Naturally, they have some dew in the mornings, but this dries up early. So there is less fungal disease pressure than outdoors. Additionally, we do a better job of monitoring the indoor crops than those in the field. So the hoophouse is a good place to “audition” varieties we haven’t grown before, and to grow those delicious but temperamental ones that we no longer grow outside. This year we grew 20 varieties, with at least two plants of each. A few are F1 Hybrids, most are OP. We are lucky enough to be able to grow some of what we like best without a lot of attention to whether it would be a commercial success or not. But there comes a point (usually in the heat and busyness of summer!) 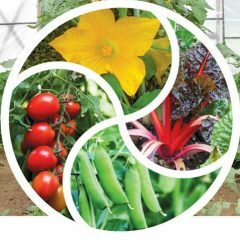 when we want to know which varieties are productive and disease-resistant, as well as delicious. We haven’t time to cosset the losers. We want to invest our time wisely and get good results. And we want to boot the worst to make way for trying some other varieties next year. 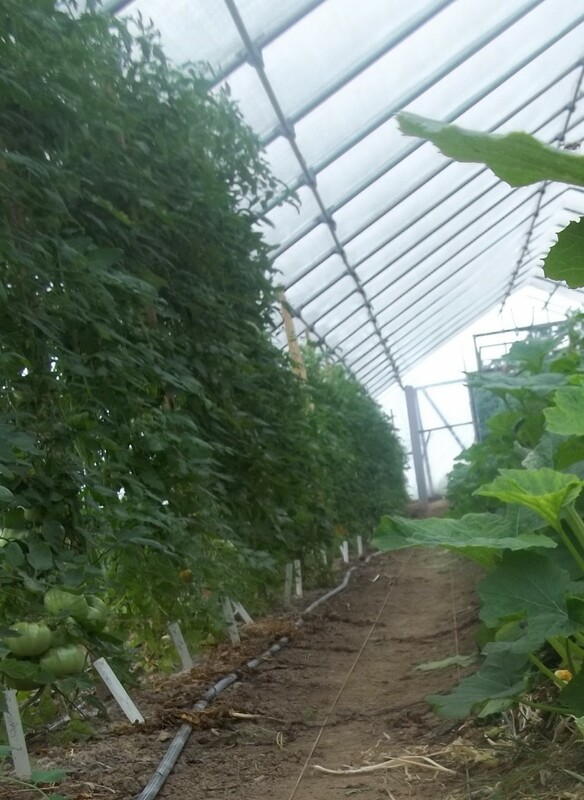 I already wrote about the “Rampancy Rating” tomato height chart which we use to plan for the shortest plants at the east end and tallest on the west (for best lighting along the rows). Now here are some notes on the varieties we grew this spring, in terms of productivity and disease resistance. Flavor is very important and more subjective. All of these were tasty. 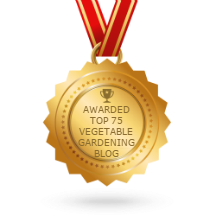 This year’s most productive tomatoes among the ones we grew in our hoophouse include Amy’s Apricot, Amy’s Sugar Gem, Five Star Grape (F1 hybrid), Garden Peach, Glacier, Mountain Magic, Stupice, Sun Gold (F1 hybrid) and TC Jones. Reasonably productive for us were Black Cherry, Green Zebra, Nepal, Riesentraube, Tropic and Yellow Oxheart. We got poor yields from Cherokee Purple, Jubilee, Moskvich, Striped German and Valencia. Now, in all fairness to tomato plant breeders, I should say these productivity ratings sometimes cause me to wonder if the plants have been “browsed” by my fellow communards. 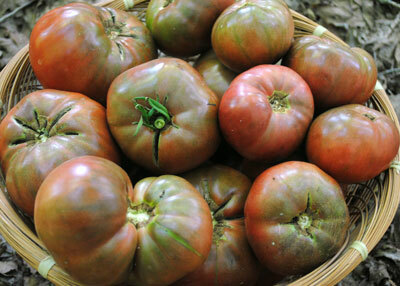 Black Cherry, Cherokee Purple and Striped German are well-known for exceptional flavor. It could be that the yield was much higher than I saw. In terms of disease, we got some Early Blight and Septoria Leaf Spot. Our most disease-resistant tomatoes were Amy’s Apricot, Amy’s Sugar Gem, Black Cherry, Five Star Grape, Jubilee, Mountain Magic, Riesentraube and Sun Gold. We usually get good disease-resistance from Tropic but it was only so-so this year. 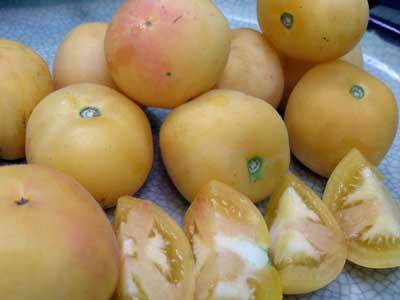 Other so-so varieties we grew were Cherokee Purple, Garden Peach, Striped German and TC Jones. More prone to diseases were Green Zebra, Moskvich, Nepal, Valencia and Yellow Oxheart. We didn’t record disease-resistance for Stupice or Glacier. We grow these two because they are the fastest and have pretty good flavor for early varieties. We don’t plan to keep them long-term. As soon as we can have bigger slicing varieties and ones without green shoulders, we’re on to them! So, looking at both productivity and disease-resistance, next year we’ll likely grow Amy’s Apricot, Amy’s Sugar Gem, Black Cherry, Five-Star Grape, Garden Peach, Glacier, Jubilee, Mountain Magic, Riesentraube, Stupice, Sun Gold and Tropic. Maybe not Cherokee Purple or Striped German unless some people fess up to surreptitious private harvesting. Maybe not Green Zebra, Moskvich, Nepal, TC Jones, Valencia or Yellow Oxheart. 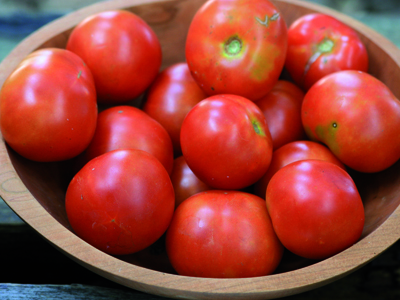 The Cornell Vegetable MD Online has a wonderful chart of disease-resistance in tomato varieties. 38 diseases, 7 physiological disorders and almost 300 varieties listed. The list is a few years old, so really new varieties won’t be there, but the heirlooms and the standard F1s are there. 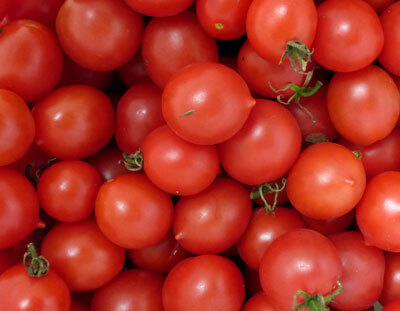 Research at Penn State Extension provides this list of “Best Tunnel Tomatoes”:BHN 589***, Scarlet Red, Primo Red, Red Mountain*, Red Deuce, Rally **, Charger, Finishline, Rocky Top, BrandyBoy, Conestoga, Carolina Gold, BHN 876, and Big Dena. Mostly they focused on red determinate slicers. Amy Goldman’s Book The Heirloom Tomato: From Garden to Table: Recipes, Portraits, and History of the World’s Most Beautiful Fruit will tell you all the pros and cons of many heirloom varieties. 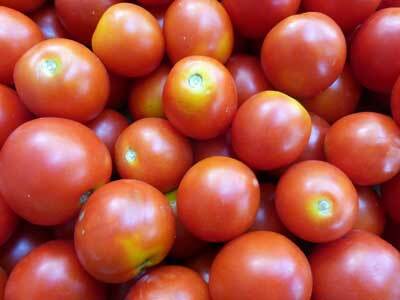 So will Craig LeHoullier’s Epic Tomatoes which I reviewed when it first came out. The august issue of Growing for Market magazine is out, along with my article about garlic. This is in the form of a checklist for each stage of harvesting, curing, snipping, sorting and storage. 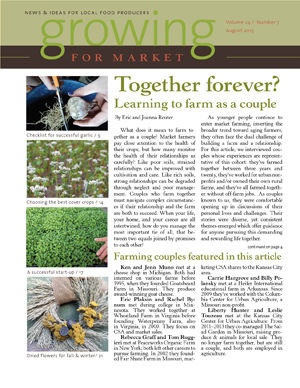 The cover article, by Joanna and Eric Reuter, whose interesting Chert Hollow Farm blog I often refer to, is about learning to successfully farm together as a couple. (The June/July issue of Growing for Market carried an article about farming as a family with a young child.) This month, Joanna and Eric have interviewed five couples, and asked probing questions about communication of information and emotional states, division of labor, dealing with the jobs neither partner likes to do, balancing sharing decision-making with allowing each other some autonomy and accepting following the other’s lead on some decisions. They also address time off, in particular, how to get time off together, as well as the general issue of limit setting. Managing stress comes up, including the challenges of supporting each other while in the midst of a farm crisis. And they close with some words of advice. I appreciated having this aspect of farming get serious consideration. It’s as vital as good transplants and good tools! In this issue is also a picture and info about a sloping deer fence that is effective without making you feel like you are working in a cage, a review of the USDA cover crops chart, where each “tile” of the chart opens up when clicked to provide more information, and Gretel Adams write about growing dried flowers and grains for winter flower arrangements. Lastly there is the encouraging and heart-warming story of Anne and Brian Bates who went from zero land and zero farm income to a 75 acre farm making $100K two years later. they financed the farm with loans from parents, USDA, NRCS and a crowd-funded 3 year loan from Kiva Zip. Their financial plan includes one-third of their income going to pay off the loans, one third in salary and one third to operating costs. Careful planning and hard work are bringing success.